“I do want to be an inspiration to young girls in Puerto Rico and America that want to box be inspired by me pushes me to do bigger and better things in my career. I can show them that you can be a powerful Latino female in the sport and achieve any goals and dreams that you have. So I am going to continue to live my life and fight in the right way to show them that dreams can come true. Amanda Serrano wants her legacy to inspire the next generation of girls to take up boxing as she prepares to challenge for World title honors in a seventh weight class when she faces Eva Voraberger for the WBO Super-Flyweight title at the Hulu Theater at Madison Square Garden on Friday night, live on DAZN in the US and on Sky Sports in the UK. Serrano (35-1-1 26KOs) has already had an immeasurable impact in women’s boxing through winning titles in six divisions on the back of an impressive amateur career, and the Puerto Rican born Brooklyn ace now believes there’s been no better time to be a female boxer. Serrano’s clash with Voraberger (24-5 11KOs) means that every American-based event on DAZN has featured a women’s World title fight, starting in Chicago where Jessica McCaskill landed the WBC Super-Lightweight title in October, Claressa Shields putting her Super-Middleweight straps on the line in Kansas in November and Lightweight title defenses for Irish sensation Katie Taylor in Boston in October and New York in December. 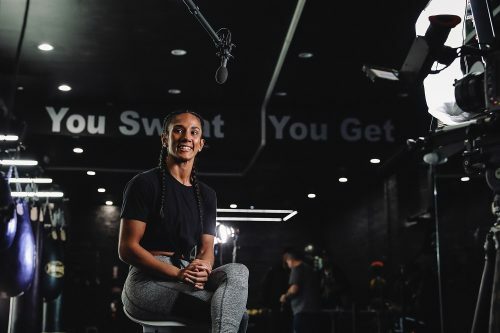 With the sport in such a great place, Serrano knows that her first pro fight at Madison Square Garden has come at the perfect time and place to both make history and encourage kids to follow her fine example. “It’ll be amazing to fight at Madison Square Garden,” said Serrano. “I won the 2008 Golden Gloves there so to go back and win a World title in my seventh division in the second home of Miguel Cotto is great, I want it to be my second home like it was for him. I think the fans will come out to support me, I can guarantee that I will do them proud and make history. Lou DiBella’s DiBella Entertainment and Matchroom Boxing’s Eddie Hearn proudly present Serrano’s clash with Voraberger on a three World title fight bill, topped by Demetrius Andrade’s first defense of his WBO World Middleweight title against Russian Artur Akavov and Irishman TJ Doheny’s maiden defense of his IBF World Super-Bantamweight title against Japan’s Ryohei Takahashi. Linares returned to winning ways in September with a third round stoppage win over Abner Cotto in September in California and starts 2019 with his 50th pro fight against Cano (31-7-1 21KOs), the Mexican former World title challenger who landed the WBC International Silver strap in his last outing in September. Long Island favorite and former World ruler Chris Algieri (22-3 8KOs) steps up his pursuit of regaining his World champion status at Super-Lightweight as he faces fellow New Yorker Danny Gonzalez (17-1-1 7KOs), while one of Matchroom Boxing USA’s rising stars tastes his first action in 2019 on the card as Reshat Mati (2-0 1KO) returns to the scene of his last outing in October where the ‘Albanian Bear’ went the four round distance in his second fight.